Dermal fillers are used to restore volume and reduce lines and wrinkles as well as being used to contour areas such as cheeks and reduce dark circles under eyes. The dermal fillers used at Facial rejuvenation are based on hyaluronic acid. Hyaluronic acid is found naturally in the skin and gives skin its elasticity, but as we age it is diminished which results in lines and wrinkles appearing. The filler is a clear gel that is injected under the skin, it is semi permanent and eventually broken down by the body. The fillers used at facial rejuvenation are Teosyal, Juvederm, Restylane and Belotero. Which filler is used will depend on the area of the face to be treated among other things. Numbing cream will be applied to the area to be treated 30 minutes before your procedure. Dermal filler will then be injected into the skin. 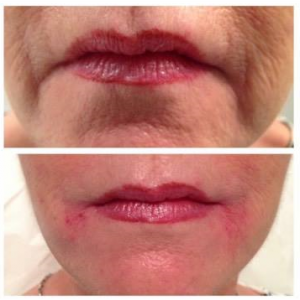 You will be able to see the effects of the filler straight away but the results will improve over the next few weeks. Often the area treated will be red and maybe swollen, sometimes bruising can occur. This will all subside after a couple of days. The types of dermal fillers used at Facial rejuvenation are generally very safe and have a very good safety record. The mains risks are bleeding (during the procedure), swelling and brusining. As with most things there is a rare possibility of an allergic reaction and therefore it is important your practitioner is medically trained (Like Dr Thomas) and knows what to do should any complications arise. All risks and complications will be discussed at your consultation and you should always disclose any medical conditions to Dr Thomas. Most people cope well with the procedure and notice only a mild stingy sensation. Numbing cream can be applied to the area to be treated to make the procedure more comfortable. When treating the lips, a dental block can also be used, this completely numbs the lips but may create slightly more swelling. Most dermal fillers also contain local anesthetic within the gel, which, once injected numbs the area. Types of anesthesia can be discussed at your consultation. This will depend on the individual client and their habits, the area treated and the type and amount of dermal filler used. In general dermal fillers last between 6-18 months. Yes. As dermal fillers don’t need to be ordered via prescription, if in stock , it is possible to have treatment the same days as the consultation. 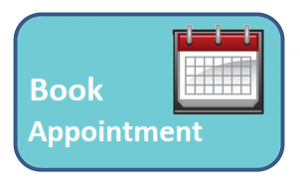 However it is encouraged that you take some time to fully consider your treatment options and therefore make an additional appointment for your procedure. 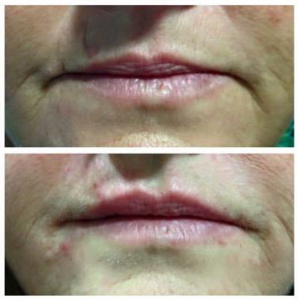 This photo shows how dermal fillers can be used to reduce peri-oral lines and scarring around the mouth.